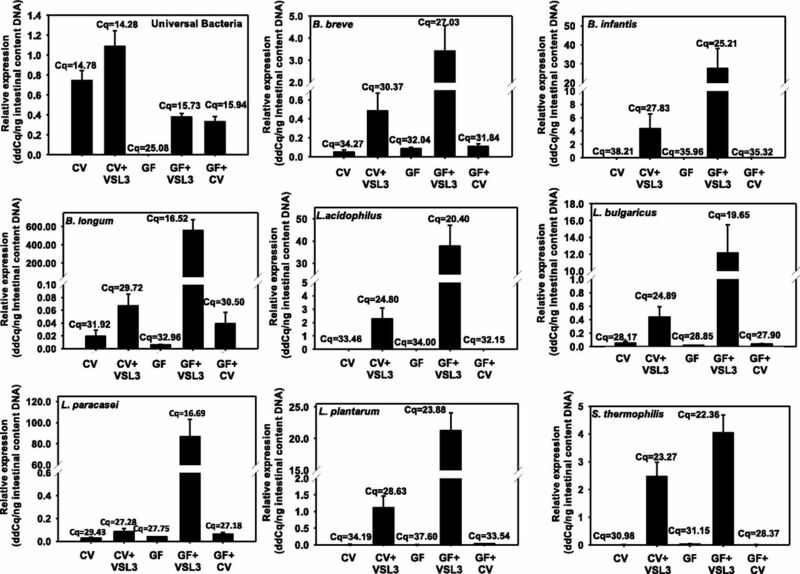 The 16S rRNA abundance of universal bacteria, as well as the eight bacterial components in VSL3 (B. breve, B. infantis, B. longum, L. acidophilus, L. bulgaricus, L. plantarum, L. paracasei, and S. thermophilus) in the large intestinal content. DNA samples from CV, CV+VSL3, GF, GF+VSL3, and GF+CV groups. Large intestinal content DNA was extracted as described in Materials and Methods, and 5.6 ng of total DNA was loaded in each well of the qPCR reactions. Results are expressed as delta-delta cycle value (calculated as 2^[−(Cq − average reference Cq)]) of the quantitative PCR (ddCq) as compared with the universal bacteria. 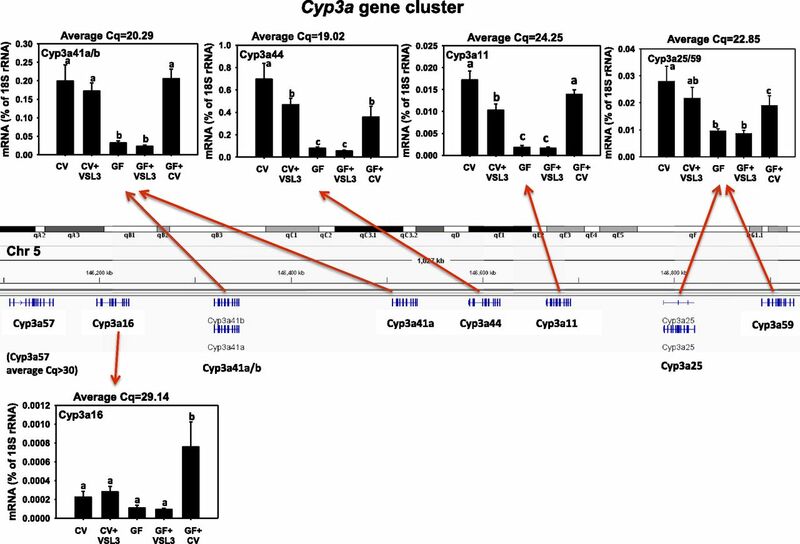 The mRNA expression of the Cyp3a gene cluster (Cyp3a41a/b, 3a44, 3a11, 3a25/59, 3a57, and 3a16) in liver samples from CV, CV+VSL3, GF, GF+VSL3, and GF+CV groups. The genomic locations of the Cyp3a genes are displayed using the Integrated Genome Viewer. Reverse-transcription qPCR for each gene was performed as described in Materials and Methods. Data are expressed as the percentage of the housekeeping gene 18S rRNA. Statistical analysis was performed using analysis of variance followed by Duncan’s post-hoc test with P < 0.05 considered statistically significant. Treatment groups that are not statistically different are labeled with the same letter. 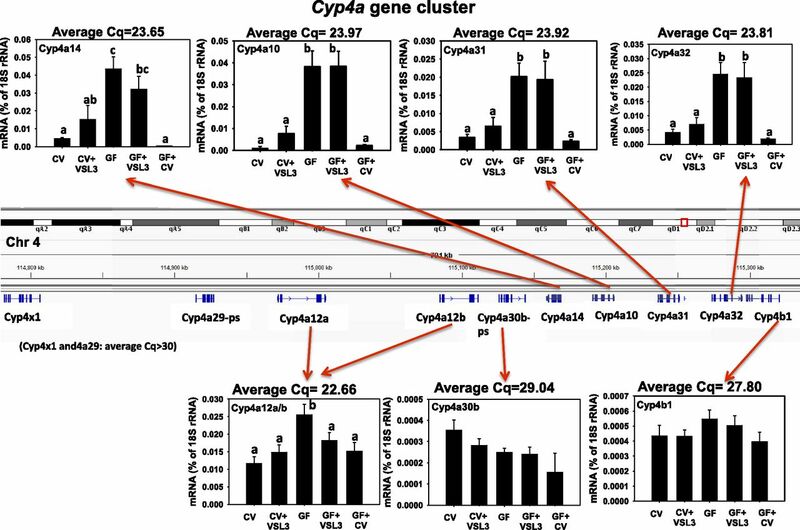 The mRNA expression of the Cyp4a gene cluster (Cyp4a14, 4a10, 4a31, 4a32, 4x1, 4a29, 4a12a/b, 4a30b, and 4b1) in liver samples from CV, CV+VSL3, GF, GF+VSL3, and GF+CV groups. The genomic locations of the Cyp4 genes are displayed using the Integrated Genome Viewer. Reverse-transcription qPCR for each gene was performed as described in Materials and Methods. Data are expressed as the percentage of the housekeeping gene 18S rRNA. Statistical analysis was performed using analysis of variance followed by Duncan’s post-hoc test with P < 0.05 considered statistically significant. Treatment groups that are not statistically different are labeled with the same letter. 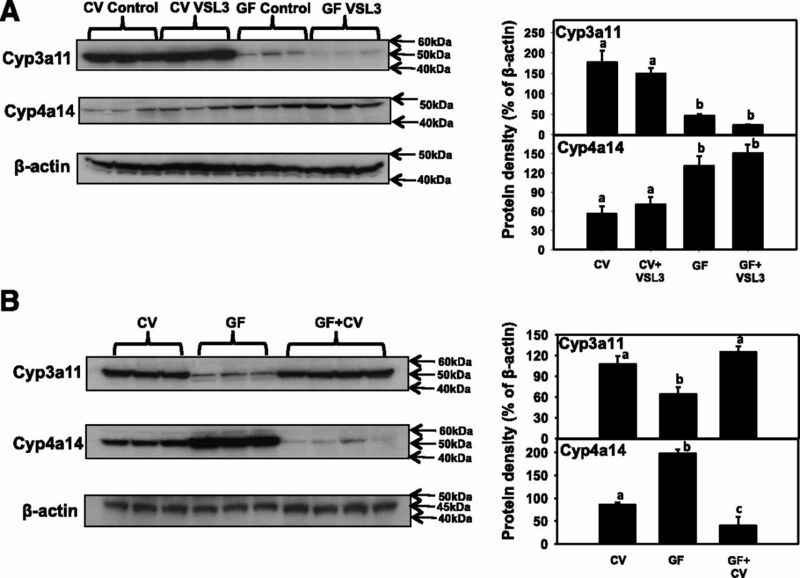 (A) Protein expression in livers of CV and GF mice treated with vehicle or VSL3 (n = 3 per group). (B) Protein expression by western blots in livers of control CV, GF, and GF+CV mice (n = 3 per group). 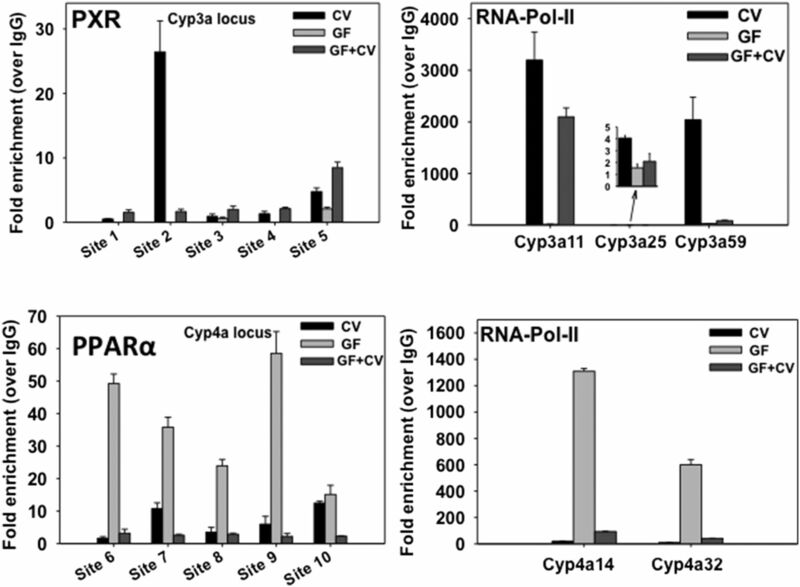 Western blotting of Cyp3a11, Cyp4a14, and β-actin proteins in hepatic microsomes was quantified as described in Materials and Methods. Quantification of protein band intensities after normalization to the loading control β-actin was performed using ImageJ software. Statistical analysis was performed using analysis of variance followed by Duncan’s post-hoc test with P < 0.05 considered statistically significant. Treatment groups that are not statistically different are labeled with the same letter. 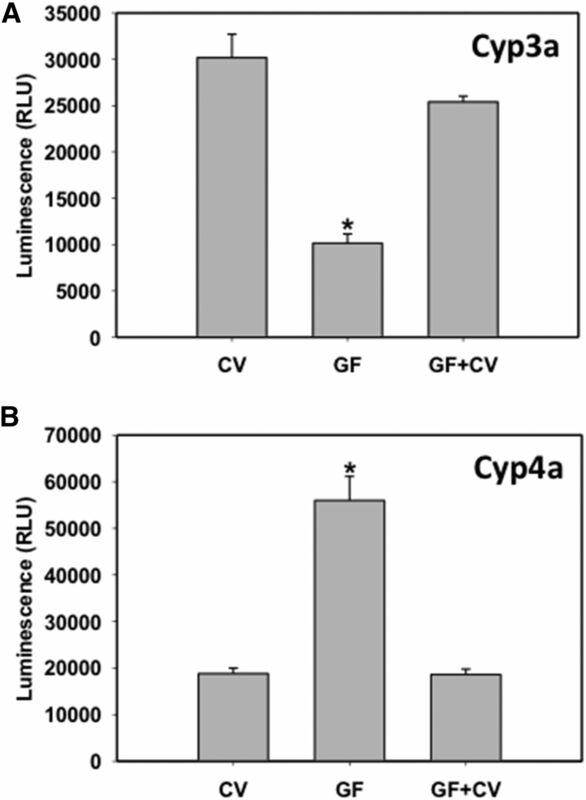 Enzyme activities of Cyp3a (A) and Cyp4a (B) in crude membranes of livers from CV, GF, and GF+CV mice. P450 enzyme activity determination was carried out according to the manufacturer’s protocol, as described in Materials and Methods. *Statistically significant differences as compared with CV mice. 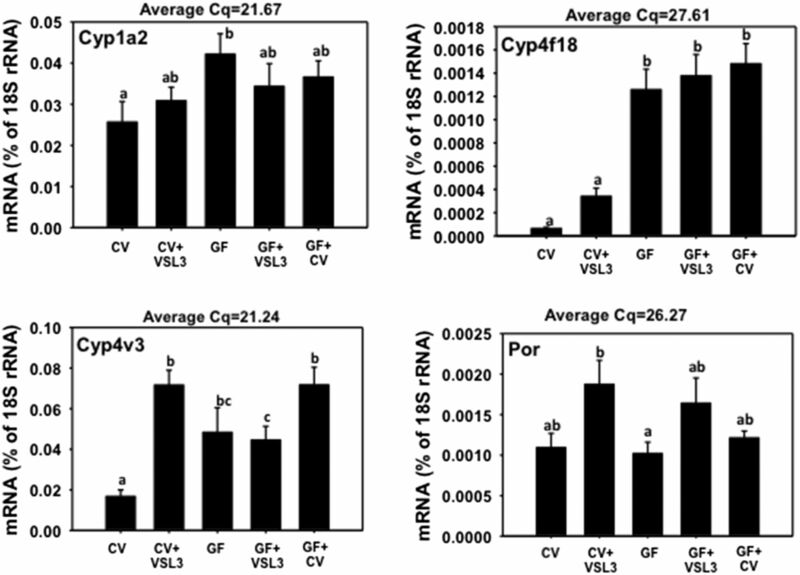 The mRNA expression of Cyp1a2, 4f18, 4v3, and P450 oxidoreductase (Por) in liver samples from CV, CV+VSL3, GF, GF+VSL3, and GF+CV groups. Reverse-transcription qPCR for each gene was performed as described in Materials and Methods. Data are expressed as the percentage of the housekeeping gene 18S rRNA. Statistical analysis was performed using analysis of variance followed by Duncan’s post-hoc test with P < 0.05 considered statistically significant. Treatment groups that are not statistically different are labeled with the same letter. 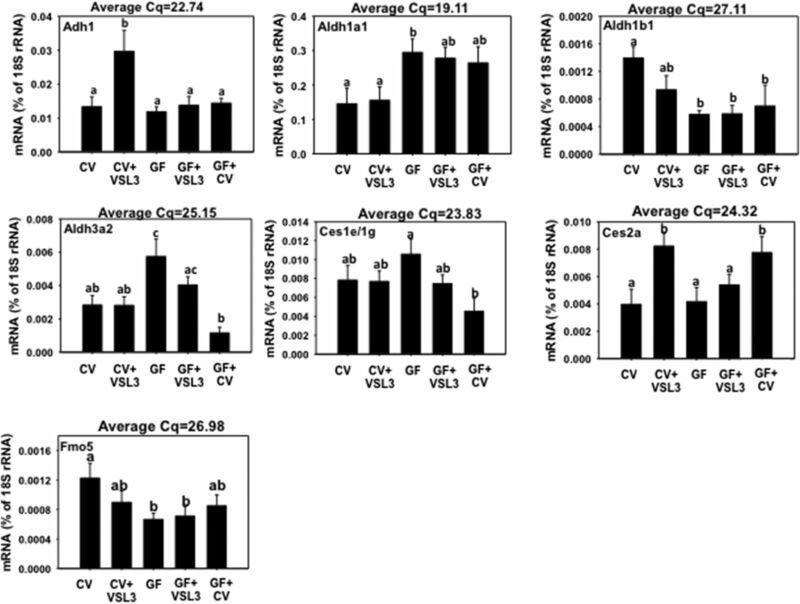 The mRNA expression of Adh1, Aldh1a1, Aldh1b1, Aldh3a2, Ces1e/1g, Ces2a, and Fmo5 in liver samples from CV, CV+VSL3, GF, GF+VSL3, and GF+CV groups. Reverse-transcription qPCR for each gene was performed as described in Materials and Methods. Data are expressed as the percentage of the housekeeping gene 18S rRNA. Statistical analysis was performed using analysis of variance followed by Duncan’s post-hoc test with P < 0.05 considered statistically significant. Treatment groups that are not statistically different are labeled with the same letter. 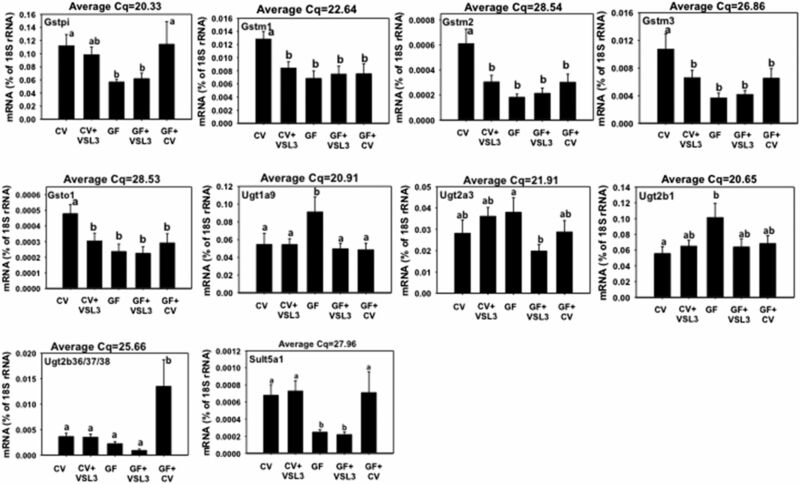 The mRNA expression of Gstpi, Gstm1-m3, Gsto1, Ugt1a9, Ugt2a3, Ugt2b1, Ugt2b36/37/38, and Sult5a1 in liver samples from CV, CV+VSL3, GF, GF+VSL3, and GF+CV groups. Reverse-transcription qPCR for each gene was performed as described in Materials and Methods. Data are expressed as the percentage of the housekeeping gene 18S rRNA. Statistical analysis was performed using analysis of variance followed by Duncan’s post-hoc test with P < 0.05 considered statistically significant. Treatment groups that are not statistically different are labeled with the same letter. ChIP-qPCR of the DNA binding for PXR and RNA-Pol-II to the Cyp3a gene loci, as well as PPARα and RNA-Pol-II to the Cyp4a gene loci. For PXR, sites 1–5 were selected based on the reanalysis of a published PXR-ChIP sequencing experiment in control adult conventional male mouse livers (Cui et al., 2010), and qPCR primers were designed centering the known PXR-DNA binding motifs (DR-3, DR-4, ER-6, and ER-8) in these regions. For PPARα, sites 6–10 were selected based on the reanalysis of a published PPARα ChIP sequencing experiment in control adult conventional male mouse livers (NCBI Gene Expression Omnibus Database query data set GSE61817; Lee et al., 2014), and qPCR primers were designed centering the known PPARα-DNA binding motif DR-2 in these regions. For RNA-Pol-II, qPCR primers were designed centering the TATA box within the promoters of the target genes. ChIP assays were performed using specific antibodies against PXR, PPARα, RNA-Pol-II, and IgG as described inMaterials and Methods. Data were first normalized to genomic DNA input, and then expressed as fold enrichment over IgG control. ↵a *Differentially regulated in GF livers.